In March 2017, a salvage excavation was conducted in a lot at 30 Ha-‘Azma’ut Street in Yehud (Permit No. A-7975; map ref. 189523–601/659500–91), prior to construction. The excavation, undertaken on behalf of the Israel Antiquities Authority and financed by the G.L.M. Company, was directed by E. Jakoel, with the assistance of Y. Amrani and E. Bachar (administration), Y. Elisha (field preparation), A. and L. Weinblum (computerization), M. Kahan and M. Kunin (surveying and drafting), C. Ben-Ari and A. Dagot (GPS), A. Peretz (field photography), M. Shuiskaya (pottery drawing), E.C.M. van den Brink and O. Segal (ceramics), Y. Nagar (physical anthropology), O. Ackerman (geomorphology), N. Marom (archaeozoology), Y. Vardi (flint), P. Gendelman (scientific guidance), E. Kamaisky (pottery restoration) and L. Kupershmidt (metallurgical laboratory). Additional help was rendered by A. ʽAzab, D. Massarwa, G. Itach and A. Glick. 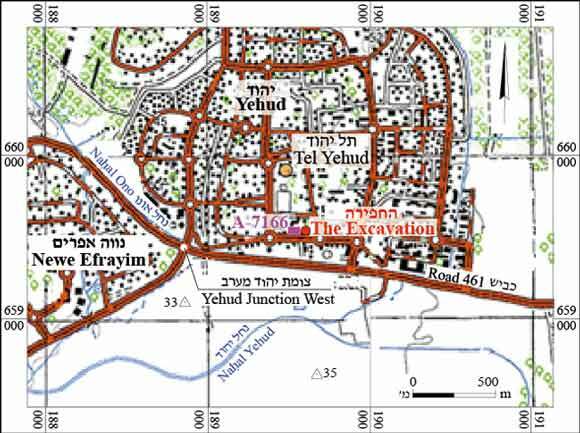 The excavation was conducted in the southwestern part of Yehud, c. 300 m south of Tel Yehud (Fig. 1). The finds were exposed c. 2 m below the modern street level, following the removal of a layer of clay mixed with modern refuse. 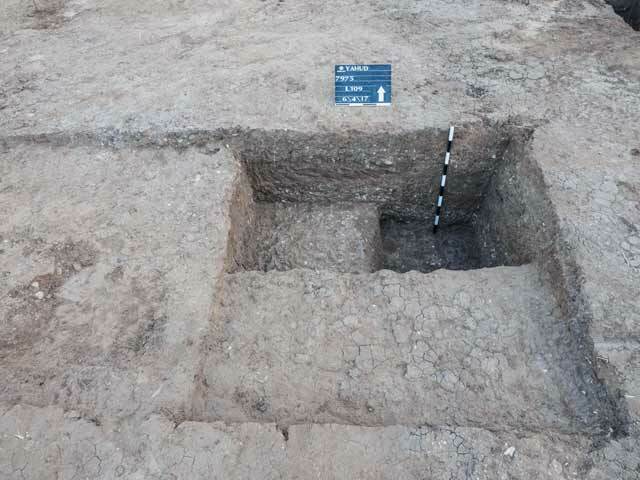 Remains ascribed to the Chalcolithic period (Stratum I) and two tombs from the Late Bronze Age (Stratum II) were revealed. 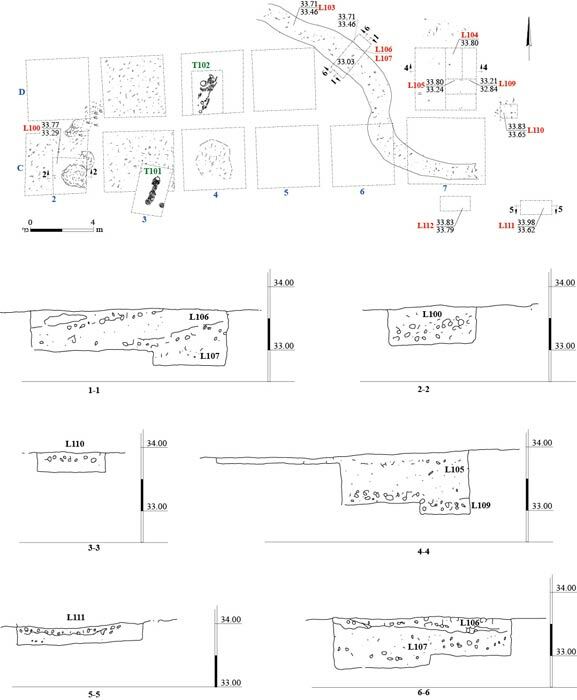 Previous Excavations in the immediate vicinity uncovered remains ranging in date from the Chalcolithic period to the Ottoman period, which included architectural remains, installations and tombs (Jakoel and Be’eri 2016; Fig. 1: A-7166). Chalcolithic Period (Stratum I). Remains of a streambed (L103; width c. 1 m; Figs. 2, 3), which was active during the Chalcolithic period, were exposed in the eastern part of the excavation area. It seems that this was the ancient channel of Nahal Yehud, which currently runs c. 500 m south of the site. The streambed—an elongated, narrow depression—contained a concentration of river pebbles, granules and manganese concretions, as well as flint fragments and flakes that were deposited on brown clay bearing a grumic structure and on sediments. The stream’s flood plain consisted of a laminar structure of alternating sand and clay sediments. The width of the streambed and it’s the size of its flood plain corroborate our assumption that a large amount of water flowed in this stream. Furthermore, Melanopsis praemorsashells found in the streambed indicate that it carried fresh water. To the east of the streambed was a somewhat circular depression in the ground, where water had probably once collected. The streambed (Fig. 4) yielded pottery sherds from the late Chalcolithic period and a large quantity of flint debitage, mostly cores and flakes, as well as several flint tools. It seems that the Chalcolithic residents of the site utilized the numerous pebbles along the streambed as a readily available material for their flint industry; after knapping the tools, the debitage was discarded into the stream. This explains the small amount of tools that were found in comparison with the large amount of debitage. Chalcolithic-period activity areas were exposed on either side of the streambed; these included two habitation layers (Fig. 5), which yielded numerous sherds belonging mainly to small- and large-sized bowls and jars. A few fragments of basalt vessels, flint tools and animal bones were also found. The stream as water source was presumably one of the main reasons for settlement at the site. Late Bronze Age (Stratum II). Two Late Bronze Age tombs (T101, T102; Fig. 2) were dug into the Chalcolithic stratum. Shaft tombs, which were generally dug into clay soil, were a common burial method during this period. Only the bottom part of the tombs, where the deceased and funerary offerings were placed (Fig. 6), was exposed. The graves were aligned along a northeast–southwest axis and contained a single interment. The deceased were laid out in a supine position, with their legs extended straight while one or both arms were bent. Funerary offerings were placed around the dead, including a variety of pottery vessels, such as jars, open bowls of various sizes, carinated bowls and several types of jugs and juglets. Numerous imported vessels were found, indicative of the extensive trade networks that existed during this period. 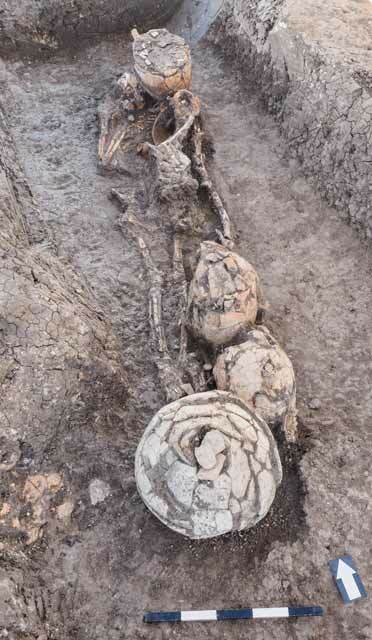 Two metal toggle pins and animal bones were also discovered. 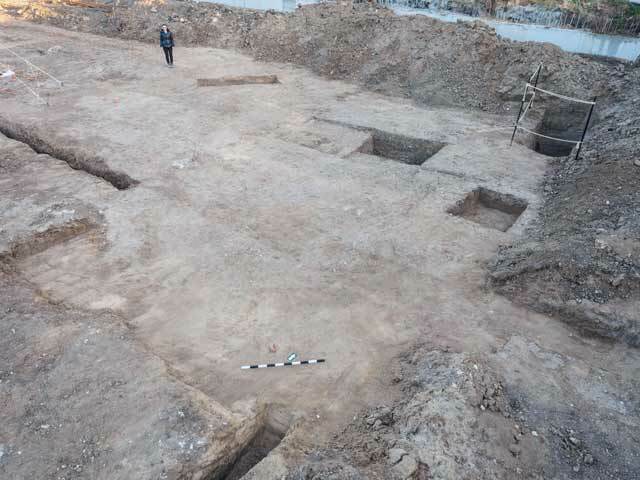 The excavation yielded the remains of an ancient streambed, habitation levels from the Chalcolithic period and two tombs from the Late Bronze Age. These finds enrich our knowledge of the site of Yehud, and add to our understanding of the settlement’s plan during the Chalcolithic period and the Late Bronze Age. The Chalcolithic-period remains are unique, shedding light on the settlement in the region of Tel Yehud during this period. Jakoel E. and Be’eri R. 2016. Yehud, Ha-‘Azma’ut Street. HA-ESI 128. 3. The streambed floor, looking northwest. 4. A cross-section of the streambed floor, looking northwest. 5. Chalcolithic habitation levels, looking north. 6. Tomb 102, looking northeast.